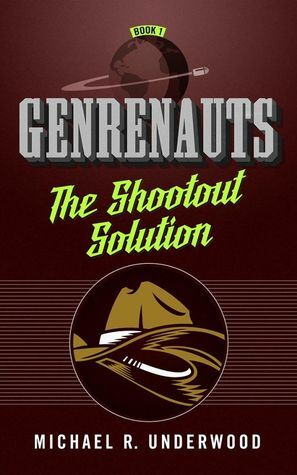 The Shootout Solution is the first in a series of novella’s by Michael Underwood, looking at a series of inter-dimensional troubleshooters, dealing with crises in worlds that are actively constrained by what we think of as literary genre convention. The world that Underwood crafts is a well drawn one. It has roots in our own world, with a team of “Genre-nauts”, part of a shadowy agency with an interest in inter-dimensional stability. Our world, or “Earth Prime” as it’s known, is surrounded by other worlds, worlds where the conventions of different literary genres hold sway. So there’s a world wrapped in the mythos of the Western, a Science-Fiction world, a world constrained by the mores of Detective stories, and so on. It’s a nify conceit, and one which Underwood runs with – because the genre-nauts are aware of the constraints of the genre, they can act both inside and outside of it in order to keep things on track. If a story has managed to go off-piste, they act as troubleshooters – creating a new hero out of whole cloth, using genre conventions to nudge the world back into the standard alignment. This first novella takes us to the Western world, and Underwood makes us feel it. There’s saloons. There’s a reluctant hero. A set of fairly feisty villains. And it all fits within the framework of a Western, with some knowing nods to the gallery from the cast. Underwood’s prose is solid and direct – it’s a clean and easy read, telling you what you need to know, and pushing things along nicely. The descriptions, of people and places, are thorough enough to give the reader a foundation for their imagination, but not too overblown. The characters – well, they get a little less room than I’d like. That said, our protagonist is a stand-up comedian, and the reader’s time with her is well spent. There’s enough there to make her an identifiable protagonist, filled with a shocking degree of pragmatism and logic. No immediate heroics here – Underwood gives us an everywoman heroine who acts plausibly; her emotions and actions feel in-line with the everyday, non-heroic experience, and it’s great to see this played straight, as she falls into a world mapped by genre convention and tropes. The supporting cast get less time – they have enough physical description to make them distinctive, and a sufficiency of personal traits to break them out from each other in dialogue, but really, I wanted more time to get to know them better. Still, this may be resolved in later volumes, and they fill their roles rather well, so I won’t complain too much – they’re carried, in part, by the excellent dialogue, with the kind of energetic and plausible banter which is always a joy to read. The plot – well, there’s some excellent setup, prior to the main event. It’s great diving into a world of grungy comedy nights, even if only briefly. The pace picks up as the cast comes together though, and thereafter the narrative – presumably deliberately – follows the form of the Western it’s describing, with a gradual build up, and an action-packed climax. That said, the move from one to the other is well done – the writing keeps the reader in the moment, and breaks up action with moments of character introspection nicely. I won’t spoil it, except to say the plot is, above all, rather fun. Is this worth reading? I think so. It’s got a clever, rather cool central idea. It has a plot built around that which keeps up suspense, whilst giving you a protagonist to care about, portrayed well, in a world which feels believable – perhaps by virtue of the setting for that world. I’d like to see more of all of the characters, and really, more of the setting in general, but that’s more recommendation than complaint!